My Perennial Sage, or as I know it as, Salvia, has started to show it's vibrant violet flowers. My aunt gave me this plant as a transplant from her garden last summer. With little care, it has thrived in my full sun bed and has attracted butterflies - just yesterday I saw a huge monarch butterfly on it. 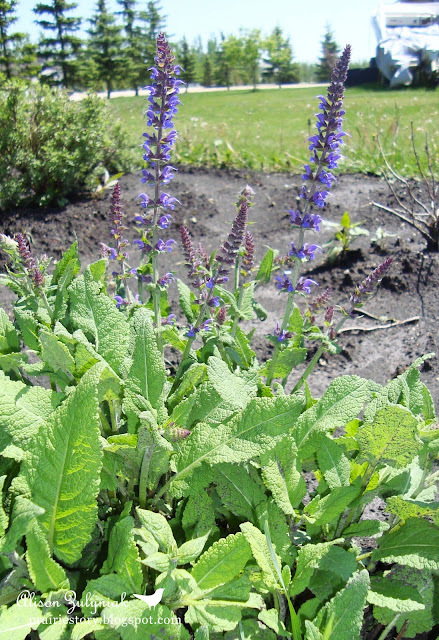 The name Salvia comes from the Latin salvere, meaning “to save,” referring to the plant’s curative properties to treat ulcers and snake bites, and to improve memory. Sage is also known as a herb with it's popularity in stuffings, soups, stews and sausage. Next spring, I hope to divide this plant to expand the grouping along the border of my peony bed. Your sage plant is vibrantly healthy! The colours of the flower is really pretty. My plant is not doing well, infested by some garden pests. Trying to save it now. Hope it will survive, otherwise I will have to pay a visit to the nursery!